Moving around in a gigantic vehicle on a busy route is not the same as driving your personal car, and the risks associated with it aren’t the same either. The negligence on the driver’s part could be catastrophic for both the driver and the drivers and passengers of nearby vehicles despite the size and structure of their vehicles. The most common duties of a truck driver (lorry driver) include transporting raw material to industrial areas for production, finished goods to warehouse, distribution, and customer service and sales. Some truck owners drive themselves while some others lease these vehicles to contractors. It is however essential to know the basics of driving and also the difference between heavy goods vehicles and personal transportation. Having a car license and being over 18 years of age are the two basic requirements for anyone willing to become a truck driver. Not only that but also a professional certification of competence (CPC) has to be acquired in order to be eligible for driving heavy goods vehicles. This is for those individuals who drive trucks as their careers and that too full time (part time drivers should meetthe prerequisites too). For driving a coach, lorry, or a bus, these basic requirements help ensure that the training of the drivers is complete and that they are fully aware of the road safety tips and techniques. In order to acquire driver’s CPC (Certificate of professional Competence), the drivers need to apply for it, pass four tests for the needed qualification, complete the training session, and attend the periodic training. This training session has to be attended every 5 years (35 hours) to stay up to the mark with the latest trends and standards. It is also important to sign a declaration after an interval of five years to show that you’re physically fit and the medical conditions allow you to stay with the profession of driving trucks/ coaches/ buses. This is all done till a person reaches the age of 45 years and after that, the driver has to provide medical records and renew the license each year till they reach the age of 65. HGV or Heavy goods Vehicle license is the one acquired to drive heavy vehicles for the purpose of transportation and transporting goods and various other similar purposes. The vehicles over 3,500 kilograms and trailers of the weight of 750 kilograms are included in this category of heavy goods vehicles. An HGV license requires the candidate to be of an eligible age (above 18 years) and pass the basic driving test as a prerequisite. The training commonly takes 4 to 5 days (depending upon the experience and performance) and one of the common perks is the starting salary that could be ranging around 25k annually with subsequent increments. It’s not your routine trip to the grocery, it is a long route you’re taking and for that you need to be sharp and present-minded. It is essential to eat and sleep properly before you get behind the wheel. Also, one of the major threats to safety is drunk driving. So avoid drinking when you know you’ll be on the road in the morning. It’s a good idea to check on weather updates before leaving for the transportation of goods on your truck. Whether or not it’s a long route, make sure you’re updated and prepared for the weather conditions. Also, it is important to carefully consider speed adjustments on wet roads and slippery slopes (if any). In bad weather (rain or snow), it is advisable to let your indicators glow for a good 4 to 5 seconds before you plan to change lanes and track. Also be cautious when taking hilly routes. It is often seen that overloaded trucks are victims of accidents on long routes. Thus, it is important to follow the load limit in each vehicle according to its capacity so that it’s easy to manage and carry the weight. It is also imperative for fuel economy to stack up the cargo according to the limits and not exceed them. No one can doubt the importance of vehicle maintenance, especially one which is in regular use. The maintenance of heavy vehicles is extremely important for the safety of the driver and the nearby properties and passersby. It does not have to be a restricted area marked as a danger zone. It is dangerous to drive at a high speed during busy hours near work zones, and at turnings. It is also dangerous to drive very close to other vehicles let alone high speeding in close proximity to them. 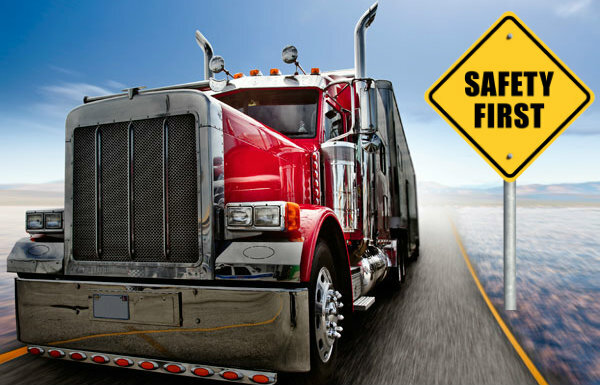 Truck drivers can easily ensure the safety of their lives and that of the people driving nearby, and also the safety of goods they’re carrying by being mindful of the important considerations. For an extra layer of safety and security it is useful to have details of an automotive locksmith service in case keys are ever lost or locks broken.